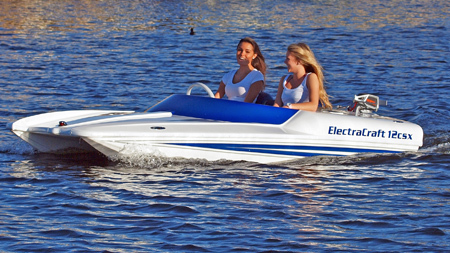 The world’s leading manufacturer of electric power boats, ElectraCraft, has broken out of its traditional family-oriented, high end, environmental-friendly electric luxury boats, made since 1975. Instead, they decided to make the 12CSX, an electric boat that is all about fun, speed, style and excitement! This sleek, 2-passenger model will have you looking stylish on the open seas, lakes and harbors, while you feel the warm breeze glide past you and you become one with the open waters. This electric boat is just what you need if you’re in the mood for zipping around on the water and letting go of your mainland worries. You can do speeds of 4.5 mph for 3 hours where you’re bounded by speed limits, such as is the case with lakes and harbors. Or you can cruise at a high speed of 6 mph for 2 hours where you can let go and sail at full throttle. It takes about 6 hours to attain a full charge. 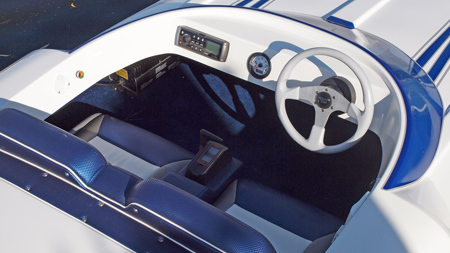 The Electracraft12CSX is equipped with an on-board computer and GPS to keep track of your whereabouts, so you don’t risk getting lost out on the ocean, especially useful for people who are new to boating. It’s powered by the German-built Torqeedo 24-Volt Cruise 2.0 R, a blend of efficiency and power (as is the norm with German machinery), which can be upgraded to a Torqeedo 4.0 R 48 Volt outboard motor and battery option, if you want to add more thrill and excitement to your experience. This makes it the most efficient power boat in its class. The 2-seater ElectraCraft 12CSX is perfect for couples who want to get away and enjoy the privacy of the open sea, or friends and family who are into trying a new experience. Your entertainment is not limited either, as you can listen to any music of your choice on the aforementioned fusion stereo, if the serene silence of the sea is not really your thing. Never before has performance and superior styling been blended into a machine that cruises the open seas with exceptional handling, and is environmentally friendly at the same time. 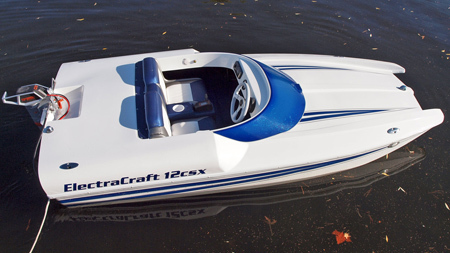 The ElectraCraft 12CSX has the advantage of coming from a manufacturer with many years of experience in the field of electric-boat manufacturing. They gathered up their years of experience through the years to come up with a unique masterpiece that is sure to give you an unforgettable experience while out at sea. A comprehensive warranty, with unmatched service capability, also come along with the package, making sure that customer satisfaction is met in the best way possible. In a nutshell, the 12CSX would be the best friend of every motor-boater out there.